Salt Lake City, UT – Back in September, Salomon announced the 2012-13 release of its first alpine touring (AT), or randonée ski binding, the Guardian 16. Our head Gear Guru participated in a Salomon focus group two seasons ago and got an early look at the first prototype of this binding and he’s been chomping at the bit for its release ever since. Luckily for us (and for him!) we recently received an exclusive opportunity to put the Guardian through its paces. The new Guardian 16 binding, to be released simultaneously under the Atomic label as the Tracker 16, is being launched in fall 2012 as a direct competitor to the Marker “Royal Family Tour” offerings, as well as all other rail style touring offerings from Fritschi and the like. First off, this binding looks like it can take a beating. With lots of metal and the same Salomon heel piece many have grown to trust, it has a solid overall feel. The DIN range goes up to 16, so all you hucksters out there be warned that you’ll have something to spend your hard-earned money on come next fall. This isn’t a light touring option. The lower stack height than that of other rail style touring bindings gives it a more of an alpine feel. When you click in you can feel that it’s solid, and with its wide platform mounting this binding to your fattest powder boards will not be a problem. 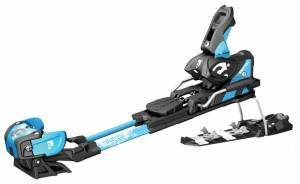 The Guardian 16 is most differentiated from the Marker offerings in that you do not have to take off the ski to engage the binding’s touring mode. A simple flip of a pole allows the binding to go easily into tour mode. Just flip the climbing bail to its lowest position and slap on the skins. The binding’s climbing bail will always need to be in at least its lowest position, otherwise the binding will go right back into ski mode when the foot is placed back flat on the ski. Some may see this as a hassle as you’d always be in a forward stance on flats, but our testers saw this as a non-issue. The pivot point is also slightly further back than on those bindings that directly compete with the Guardian 16, likely making uphill strides more efficient and comfortable. Getting back into ski mode is equally as simple. Flip the climbing bail back into its resting position and put your foot back flat on the ski to engage the heel lock mechanism. On the downhills this binding has a very alpine-like feel. Our testers found no noticeable “slop” in the toe piece that you find in most touring offerings in this class. The binding transfers the skier’s energy right to the edge of the ski, and allows the skier to carve turns with confidence. Aside from the increased stack height over traditional alpine bindings our testers had a really hard time finding any differences between the Guardian and normal alpine clamps. Since we’ve had a really low snow year thus far surrounding out headquarters in Salt Lake City, we only got a chance to run these bindings on groomers at Alta Ski Area. Our testers believe that if these bindings perform as well as they did for us on the hard packed, low snow conditions that we skied them in, that they will perform equally as well in the soft conditions most often found in the backcountry. Also as a result, our testers have yet to actually tour in the Guardian 16, but as soon as we have a chance we will be sure to report back here. From the feedback we’ve heard directly from Salomon athletes who have been in the field testing this binding for nearly two years, it tours as well as, if not better than what’s on the market today. It also seems to hold up to some hearty abuse, something easily dished out by Salomon athletes. In our testers’ eyes, this is a new offering from a trusted name in alpine bindings. The Guardian 16 has yet to be released to retail buyers and we will be interested to see how this binding stacks up with more widespread usage. We’ve skied nearly all the current and past offerings in this binding class and believe that Salomon has “stepped it up a notch” in alpine touring gear durability.